Ruelle rouge à St-Valery. 2015 | J.Harms. Ruelle rouge à St-Valery. 2015. J.Harms. 29x39cm. Acrylic on paper. 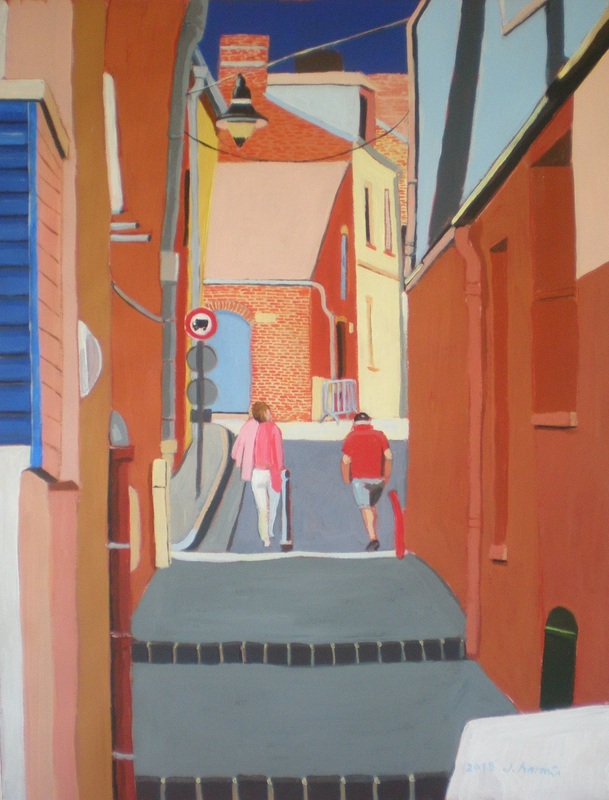 When I decided to paint a serie of views on St-Valery-sur-Somme, this particular narrow street escaped my notice at first. But while checking out the pictures again, I was immediately drawn by the red hues. I can feel the warmth oozing from those brick stone walls. I remember vividly how warm it was, and how lucky I was to visit a place with this quality of light to it. I love this. My first thought was – I love how warm it is in this picture! And I like the reduced number of colors – the gray, blue, and white and then the orange. Even the people’s clothing. I really got a feeling of place here. Love it. Thank you Ken, you made my day !